Miami Dolphins kick returner Ted Ginn Jr. was named AFC Special Teams Player of the Month for November, it was announced by the National Football League today. In five games in November, Ginn racked up 646 yards on 21 kick returns, a 31.7 yard average, while taking two of the returns for touchdowns. 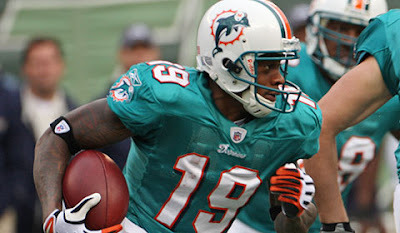 The highlight of the month came on November 1, during a Dolphins' 30-25 victory over the New York Jets, when Ginn became the first player in NFL history with two touchdowns of 100 yards or more in the same game. The third-year veteran from Ohio State also became the eighth player in NFL history with two kick-return touchdowns in a game. Additionally, Ginn became the first player to record two returns for touchdowns in the same quarter since Green Bay's Travis Williams accomplished the feat November 12, 1967 vs. the Cleveland Browns in Milwaukee County Stadium. Ginn also recorded the second most kickoff return yards in a game in NFL history with 299 which is second to Tyrone Hughes of the New Orleans Saints who registered 304 yards against the L.A. Rams on October 23, 1994. On the season Ginn has returned 29 kicks for 836 yards, a 28.8 yard average, which is currently tops in the AFC. Ginn is the second straight Dolphin to win the monthly honor for November as kicker Dan Carpenter was honored with the award during the 2008 season. He is just the third Dolphin ever to come away with AFC Special Teams Player of the Month accolades, joining Carpenter and Olindo Mare, who was honored in October of 1999.